In this second part of our blogpost on Theseus, the king of Athens who was born in Troezen (Trizina), right at the footsteps of Live-Bio, we will go through our hero’s trek to the city of Athens. We hope that you enjoy it! Mighty Theseus embarked on the long and dangerous trek to Athens. His mother stood at the gate in tears. – Don’t forget to take a cardigan, my treasure, it’s cold at night! – The son of Poseidon feels no cold, mom! Oh, damn, I keep forgetting! Ok, give me that pink jumper grandma knitted for me. It was not long before the road brought him to the first thug. Close to the town of Epidavros, Periphetes would kill by passers with his bronze club. – Hey little boy, would you like to have a look at my bronze club? – Apologies, sir, no! I am in a hurry. – That’s so rude! What about I kill you with it instead? – I don’t have a time for that either. In the meantime, do you mind if I borrow your club and kill you first? We can spare the details and just say that this was the end of Periphetes. A few kilometres down the road, not far from Corinth, Theseus bumped into the notorious Sinis. Sinis, known as the ‘tree bender’, would kill by passers by tying their legs on two bent pine trees that he would then release. – What are you doing here, little boy? – Oh, nothing sir, I beg your pardon. I was just collecting camomile for my sore throat. – Pine trees are better for sore throats. One day they will make effervescent tablets out of them. Would you like to bend these two? – Sure thing! But allow me to tie you there instead. And so he did, before swiftly moving on. 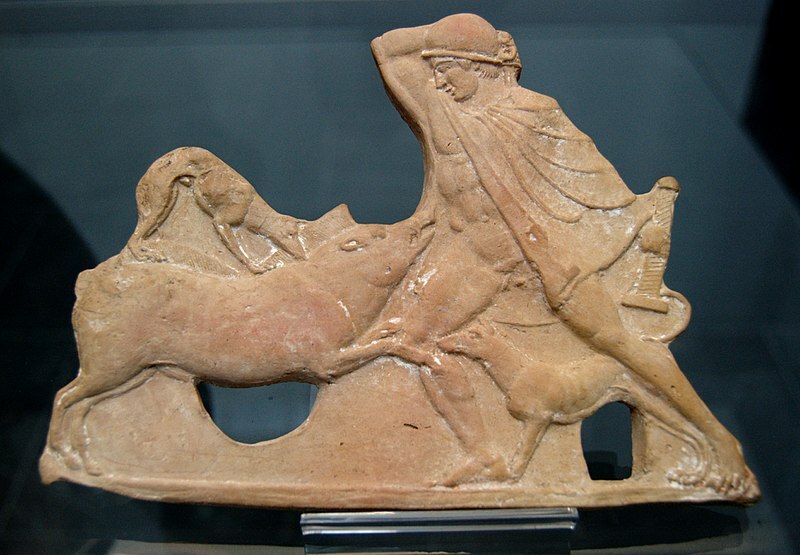 Terracota statue of Theseus killing the Crommyonian Sow. We are stealing the photograph from Munich’s Staatliche Antikensammlungen archive, as they have stolen the actual artifact from the island of Mylos. Bending trees is no easy task and Theseus felt hungry. “Why don’t I kill the Crommyonian boar?” (often referred to as the Crommyonian Sow), he asked himself. “Local people will love me for my feat, and I will finally get to practice my barbeque skills.” The boar was big and mighty. Not mighty enough for Theseus, of course. But big enough to fill his lunch boxes for a few days. There is an area on the way to Athens called Kakia Skala (translated as ‘the dangerous landing’ in modern Greek and known as the ‘Rocks of Skiron’ in antiquity). Kakia Skala is mountainous, with sharp cliffs hanging over the rough sea. Up until a long tunnel was recently excavated through the rocks, the passage was dangerous even for fearless goats. Skiron used it as the lair for his dreadful deeds. Skiron stood at the passage but, instead of asking for tolls like noble, modern day road operators would do, he asked by passers to wash his feet. As they bent, he would push them into the sea, where a giant sea turtle had set up its dining table. – Come here little boy and wash my feet. – But your feet look clean sir, the previous guy did just fine. Why don’t you wash mine instead, I could use a quick pedicure. Mighty Theseus took a deep breath and put Sinis’ feet in the washing bucket. Without much oxygen left in his lungs for a massage, he threw Skiron on the turtle’s roast beef tray, and carried on walking. In-between Megara and Elefsina our hero stopped for a quick rest. While napping he was woken up by Carcyon. Carcyon used his supernatural strength to kill by passers with his strong embrace. – Would you like a friendly hug, little boy? – No sir, I don’t do hugs with boys. My mom warned me I may end up liking it! – Oh, come on now, it’s just a hug. – Ok then, but no kisses, ok? Carcyon’s embrace was mighty, but nothing like Theseus’ grandmother who kept squeezing him tight since he was a child. He deftly out-manoeuvred the thug and hilled him instead. The last thug on the way was Procrustes, the father of Sinis. Procrustes asked people to lie on a bed. If they were taller, he would chop their legs off. If on the other hand they were shorter, he would stretch them until their dislocated limbs reached the end of the bed. -You look tired, little boy, why don’t you take a rest on this bed? -It does not seem orthopaedic and will make my scoliosis worse. Why don’t you have a nap instead? The fight lasted only a few seconds. With the finesse of a sumo wrestler, Theseus wrangled Procrustes into his own death bed. The thug’s body was exactly the length of the mattress. 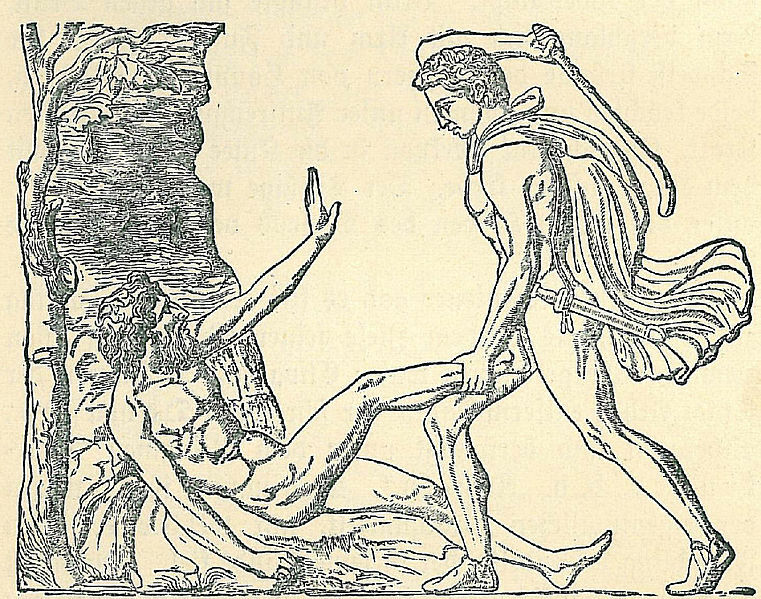 After a brief moment of confusion, Theseus decided to simply kill him with his sword. Tired and dirty from all his feats, Theseus had a bath in the river of Kifissos before making his way to the city centre of Athens. Stay tuned for the Athens part of our story. Same Theseus-time, same Theseus-channel.